At the heart and soul of every great company is its people, and we have the best. 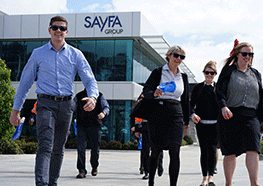 The Sayfa team will always go that extra mile to make every dealing you have with us the best experience possible. From design through to order, from fabrication through to delivery we are here to help. Our team will advise and guide you through every step of the height safety journey. It's the Sayfa way. Our team's gung-ho attitude is legendary: accelerated energy, extreme passion, mutual care, extraordinary results. At Sayfa we don't just sell height safety systems - we sell peace of mind. We see beyond the products and think about you and your workers and how can we protect them, together. When we take that order, fabricate that piece of aluminium or pack up your delivery we always have the end user in mind. We want to ensure, just as you do, that everyone arrives home safely to their families. EVERY DAY WE OFFER INNOVATIVE SOLUTIONS TO OUR CUSTOMERS. IT'S NO WONDER OUR TEAM ARE THE GO-TO PEOPLE IN THE INDUSTRY.